Just when you thought you have had enough kale – This recipe has been passed around my family for a few years. Originating from my sister who lives in Portland, Oregon & shops at New Seasons Market. If kale salad isn’t your thing try adding kale to a fruit smoothie! 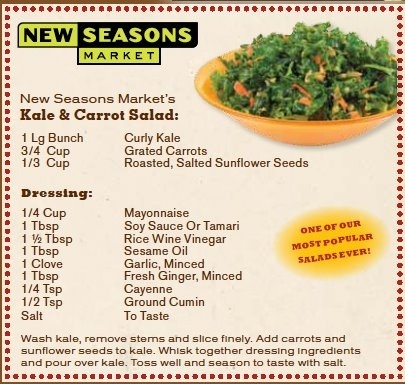 This entry was posted in Produce, Recipes and tagged Carrots, Kale, Recipes, Salad on August 23, 2015 by darbymeadow.